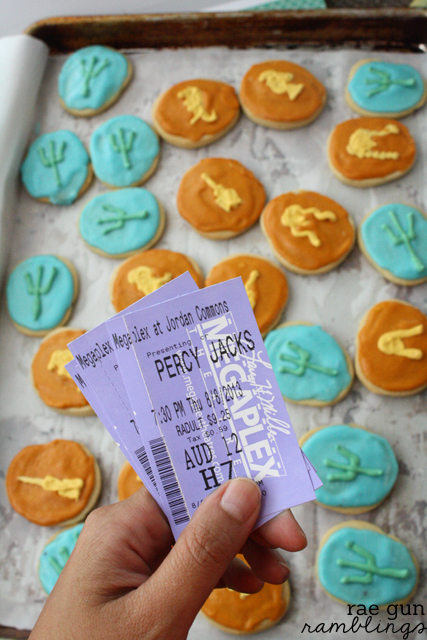 So I just got home from watching Percy Jackson Sea of Monsters with a few of the local girls from the book club. It’s a while since I’ve mentioned the book club so if you don’t know I run an online book club on goodreads open to anyone anywhere and we talk books. But those of us who are local try to get together to watch the movies that have been made from books so it’s a lot of fun. 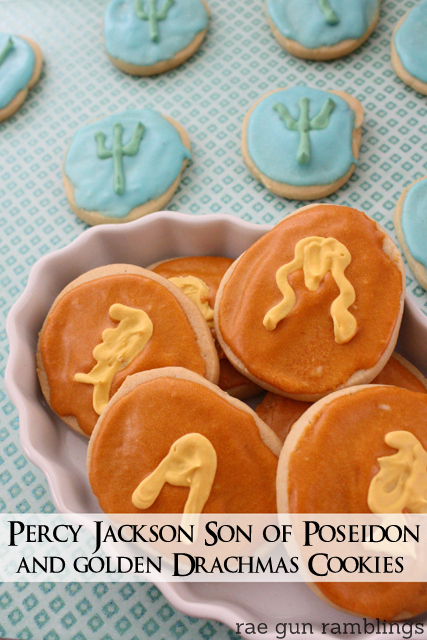 Well like I always do I wanted to bring a little book/movie themed treat so I decided to make some Percy Jackson Cookies. 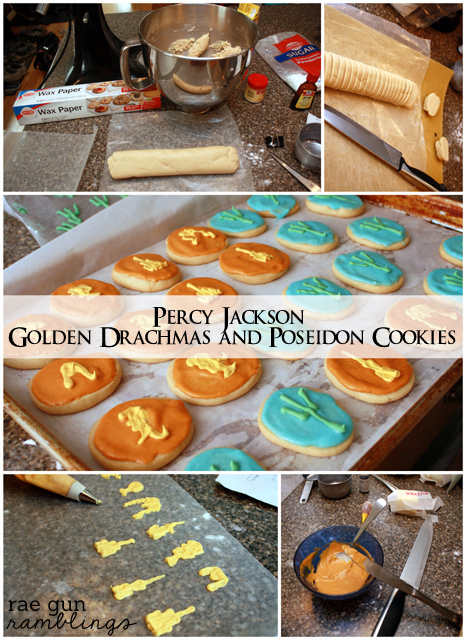 In the books the kids always have to use golden drachma coins to call for help or get taxi rides and in honor of Percy and Tyson, sons of Poseidon I made some Poseidon cookies. Now I know these cookies would never win a cuteness award when compared to all the awesomeness that is out there in the world of cookie decorating but I think the yumminess and geekiness of them should compensate ;) Plus they are totally doable for the average person. Mix flour, baking soda and cream of tartar in a small mixing bow. Cream sugar, butter, egg, vanilla, almond extract together. Add dry ingredients and mix well. Divide dough into two logs between wax paper; refigerate at least 1-2 hours. Slice dough into disks. Bake at 375 F for 7-8 minutes. Mix on low with 2 TBS water. For thicker mix well to thin it out add more water. You’ll want it pretty firm for these cookies. Divide and dye the icing. Using a small round tip draw faces and Poseidon tridents onto the wax paper and allow to dry completely. Mine took about an hour. You could frost the whole cookie in royal icing but I love the flavor of this recipe so I decided to do that and just make the little symbols out of royal icing. Beat all ingredients (add a couple drops of water to thin). Divide and color with food coloring. 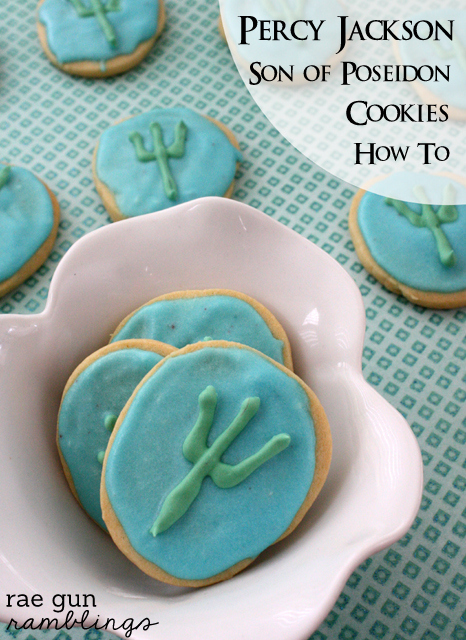 Spread onto cooled cookies and carefully remove the royal icing symbols by bending the wax paper away once they are fully dry and place them on the icing while still wet. Dang it! I should have come with you to this one! I actually read all of these books and LOVED them. These cookies are perfect Marissa! I don’t think they need to be super fancy in order to be perfect :) I bet they tasted so good too! yes you totally should’ve that would have been fun! I’ll try and remember to tag you next time I get a movie outing up. I LOVE them! Cookie decorating is one of those things I am horrible at. Not kidding. Mine could totally be in one of those Pinterest fail pictures! I love yours! 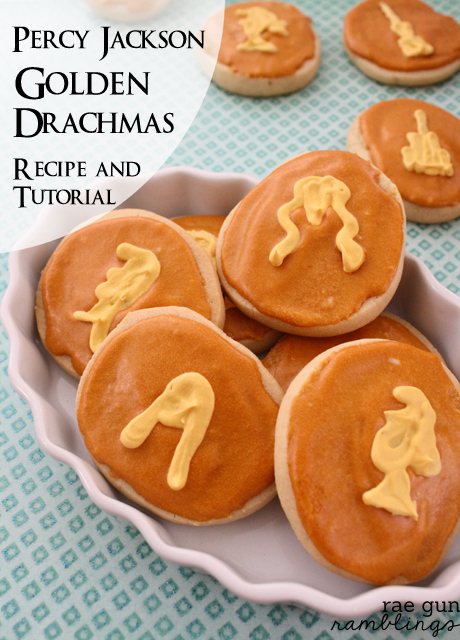 These do look really yummy – I love sugar cookies – I really want to see this movie! Maybe I will take the kids this weekend. I’ve been such a slacker reader these last few months… Time to get back into it and back into the book club! ;) These cookies are pretty yummy looking! 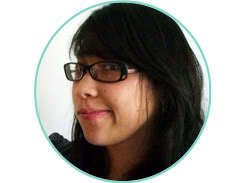 Hmmm I wonder why you were being a “slacker” now me I have no real excuse! Great job! I love decorating cookies ALMOST as much as I love EATING cookies!! They look yummy and I love that you guys get together – sounds like so much fun!